Loreta Aviles shows the almost fully-consumed rice grains from the 15 Kilograms she bought shortly after receiving the rice subsidy for the month of January on March 2017. A total of 214,218 beneficiaries of Pantawid Pamilyang Pilipino Program from Metro Manila recently received their rice subsidy amounting to P600.00 each for the month of January 2017 after complying to the conditionalities of the program. This subsidy is initiated by the Duterte administration as augmentation for said families in buying the Filipino staple food- rice- which is on top of the cash grants provided for the health and education of children beneficiaries aged 0-18 years old. Among its recipient is Loreta Aviles, 77 years old living in Nepomuceno St., Quiapo Manila who is currently the guardian of her three (3) grandchildren aged 9, 11 and 14. As a laundry washer who earns P500 per week, Loreta narrated that the cash grants they receive which amounts to P1,600.00 monthly significantly helps for them to afford their daily food and school projects of her grandchildren. 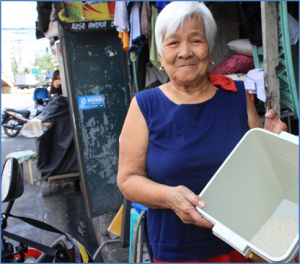 With the additional P600.00 of 4Ps rice subsidy, Loreta expressed relief that their rice consumption will no longer be deducted from the amount of cash grants they are receiving and that, this ensures that her grandchildren consume enough food every meals. “Para sa aming mahirap, basta may bigas kahit anong ulam ay pwede na…kaya’t malaking tulong ang suportang pambili ng bigas ng 4Ps,” Loreta said. Since her grandchildren’s parents have their respective separate families now, Loreta, as the sole breadwinner of her family amidst her age, still works hard to provide for their needs. Meanwhile, Loreta is also a recipient of the Social Pension program of DSWD that provides P500 cash assistance every month to qualified indigent senior citizens who are weak, sickly or bedridden and who are not pensioner of SSS or GSIS and do not regularly receive financial support from relatives.